This campaign has covered every corner of three electorates, spoken to hundreds of voters, attended and spoken at dozens of forums, run our most active social media campaign ever. Our candidates Margie, Sean and Adam have given their all for months on end. Not just active in their own areas, they have knocked on hundreds of doors in Prahran, our winnable seat in the south. The Greens get about 1/3rd of our vote from staffing early voting and election day booths. For many voters this is the only time they will see a Green all election cycle. A smiling, friendly Greens volunteer can make the difference between a vote for the old parties and a vote for us. If we haven’t been in contact with you about staffing a polling booth yet, don’t wait and please give us a call. Together, we can make the difference. We know it works! This entry was posted in Uncategorized on November 15, 2014 by Bayside, Glen Eira Greens. Choose what you can do, a couple of hours is so valuable to our campaign. Making a difference in Prahran. The BGE team will be going doorknocking in Prahran. Carpool from Brighton. Beginners and old hands welcome. If you’re new we’ll pair you with an experienced person. If you can put your hand up, rsvp to the action/s you can do. Let me know before Thursday night. I’ll get back to you with the details. This entry was posted in Uncategorized on November 10, 2014 by Bayside, Glen Eira Greens. Welcome to newcomers to this list who have been in recent contact with our intrepid team. We all share a desire for change in government – one more compassionate and visionary, acting for current and future generations, for all people and the planet. The Sandringham Festival has to be the weekend highlight with a strong Greens presence and great reception for our Sandringham candidate Adam, joined by Sue Pennicuik, MLC, Sean (Bentleigh), Rose (Upper House Support) and Derek. Heartfelt thanks also to the amazing Chris, Fraser, Cheryl and Ken. Next week can I add your name to the list? 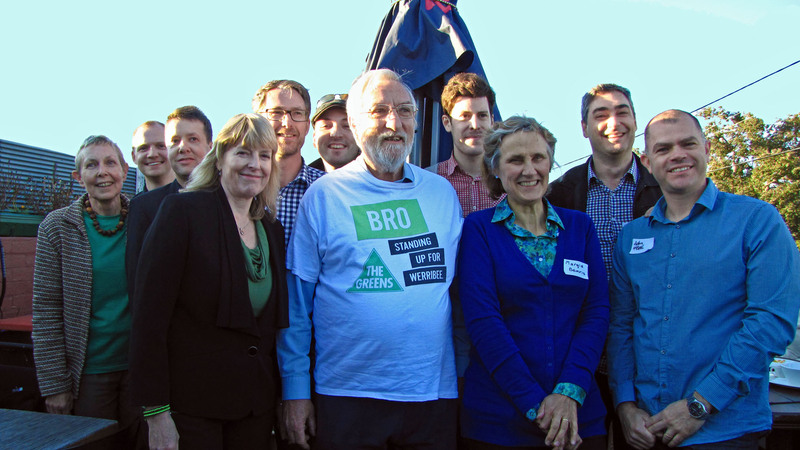 Let’s win Prahran: The BGE team will be going doorknocking in Prahran on Saturday and Sunday- carpool leaving Brighton both days. This will be a weekly email from the combined Campaign team for Sean Mulcahy in Bentleigh, Margie Beavis in Brighton and Adam McBeth in Sandringham between now and the State Election on Nov 29. We will be successful with people power and by working as a team. We’re all volunteers committed to changing politics and making a difference through action. To shift voters to vote for the Greens, we need to have lots of conversations in the lead up to the election. To do that we are speaking with local supporters and asking them to join us. We’ll be asking people like you and me to join us at our events and be part of this history-making election. Come along and help us create change. Supper and lots of training and support provided! Come and brush up your skills talking to people. · Your phone (with earphones if your have them) We have a spare if this is an issue. RSVPs would be helpful with organising lists- preferably reply to this email if you are coming. This entry was posted in Uncategorized on October 28, 2014 by Bayside, Glen Eira Greens. The Bayside Decides forum starts at 7pm on November 7 at the Hampton Community Centre hall, 14 Willis Street. Baysiders still undecided on who to vote for one month out from the state election can quiz candidates at a public forum next week in Hampton. The sitting Liberal MPs, however, won’t be there. Sandringham Murray Thompson has a prior engagement and Brighton’s Louise Asher had not responded to the convenors’ invitation when TWR went to print. 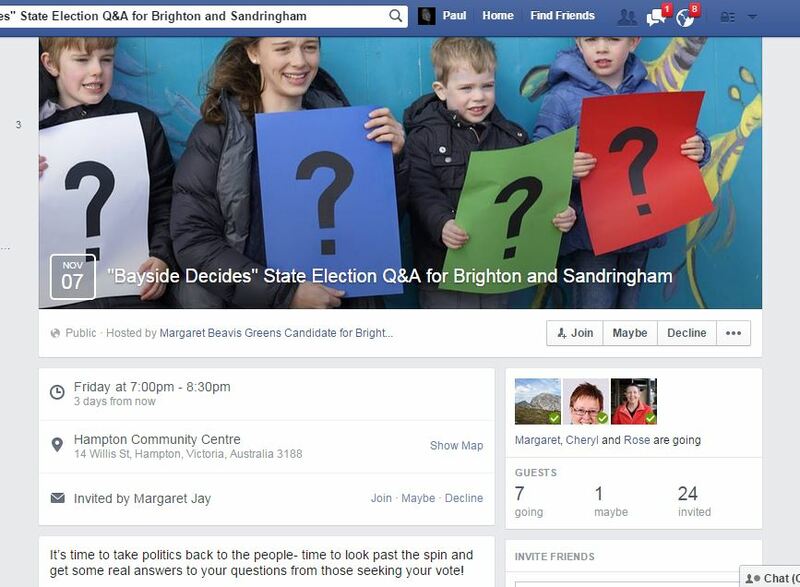 All lower-house candidates in the two blue-ribbon electorates, including the local members, have been invited to speak at the Bayside Decides forum, which Bayside mayor Laurie Evans will moderate. The audience will get their chance to grill candidates during a Q&A session and, more informally, over tea and biscuits afterwards. “It’s time to take politics back to the people, time to look past the spin and get some real answers,” said key convenor Margaret Beavis, who is the Greens’ candidate in Brighton. Dr Beavis said the forum was being promoted by Greens, Labor and independent candidates. Candidates so far include independent Clarke Martin, Labor’s Christina Zigouras and the Greens’ Adam McBeth in Sandringham, and independent Jane Touzeau, Labor’s Louise Crawford and Dr Beavis in Brighton. Established in 1856, Brighton is one of Victoria’s oldest and wealthiest electorates. It has always voted conservative and Ms Asher, who has held it since 1999, sits on a virtually unassailable 14.3 per cent margin. This has fallen from 17.6 per cent in 2010. The electorate now includes all of Elwood, following electoral boundary changes last year. Elwood has a strong Greens-voter base. Sandringham, too, is a safe Liberal seat, only changing to Labor once (in 1982, for one term). Created in 1955, it is also one of the wealthiest electorates in the state. Murray Thompson, son of former Liberal premier Lindsay Thompson, has held the seat since 1992. His margin fell slightly from 15.9 per cent in 2010 to 15.6 per cent following redistribution, which brought parts of Highett and Cheltenham east of the Nepean Highway from Mordialloc into his electorate. This entry was posted in Uncategorized on October 27, 2014 by Bayside, Glen Eira Greens. Well we blasted Bentleigh on Sunday and heartfelt thanks to Anita, Troy, Ciska who spent time with our fabulously talented candidates. Thanks also to Gen, Christine for all the calls and conversations too. Song for this week dedicated to our indigenous peoples: From Little Things Big Things Grow. Next week can I add your name to the list? The Festival is big local event for a strong Greens presence . We’re also seeking some folks to hit Highett from 2-4. This entry was posted in Uncategorized on October 23, 2014 by Bayside, Glen Eira Greens. Our campaign launch for the seats of Bentleigh, Brighton and Sandringham took off on Sunday. A good number of members and supporters and a sunny afternoon made the launch a success. We have a big job ahead of us, the goal being to get Sue Pennicuik returned to the Upper House, and increase our percentage of votes for all our candidates. “Door knocking”, “phone banking”, “street stalls’ at the farmers markets and rail stations will be our methods of reaching out to the voters. The more volunteers helping, the more voters we reach. We work in teams so experience is not important. If you have a few spare hours, consider helping us out, it’s a rewarding experience. Door knocking usually Saturday or Sunday mornings or afternoons, two hours is a good time allotment. This entry was posted in Uncategorized on September 23, 2014 by Bayside, Glen Eira Greens.